I purchased this kit 12 or 13 years ago at the Rosemont Quilt Show. I just loved those purples and had to have it! It sat and sat in a drawer for a long time and I looked at it often. The kit came with the backing as well as the pattern and fat quarters. I finally (!) decided to dig in and finished the blocks and squared them up. Then, it sat and sat a little more because I didn’t entirely understand the instructions for the sashing (instructions were very vague). 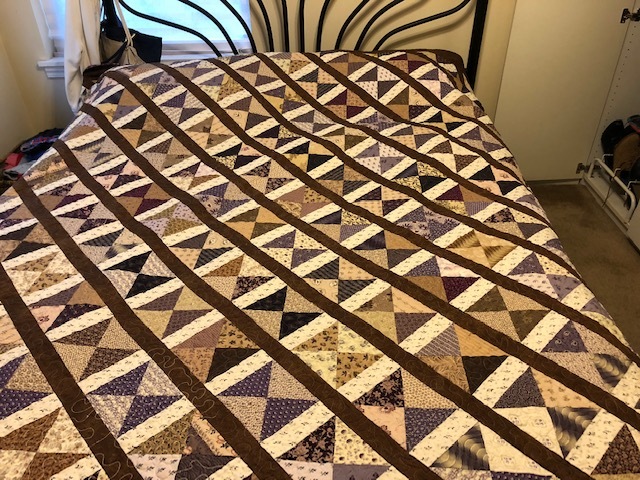 I finally put it together earlier this year, quilted it and now it’s on a bed at home. Through the years, I must have needed some of that backing for other projects because when I went to put the backing together I was short about 3/4 of a yard. Ugh! I improvised and I’m glad I did because I just love those Civil War purples! And there was so much extra purple fabric that I can make another project with it.